This is a very different kind of novel. 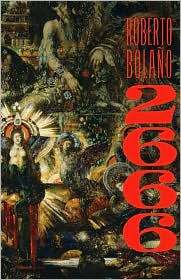 The circumstances of publishing 2666 were unusual because Bolano died shortly after completing it. He wanted it to be published in five different volumes, each a novel in their own right, published in a specific order. There is speculation that this had a practical reason: providing for his children’s future. After his death, his heirs and publisher decided to reverse his decision and publish 2666 in full. This is assuming what Bolano would have done if he had not passed away. The first book chronicles the relationship between three scholars and their quest to track down an obscure German novelist. After spanning many years and places, they end up in Santa Teresa, a border town in Mexico near Arizona. The second book tells the story of a professor and his family living in Santa Teresa. The third book follows a writer for an African-American magazine from Detroit to Santa Teresa to cover a boxing match. The fourth book literally lists the murders of many women that have happened in Santa Teresa over the last seven years and is somewhat of a detective story. I think these murders are fictional, but I didn’t do my homework. I know there have been many women murdered in Mexican border towns of late and it lends a cruel timeliness to the story. The fifth book circles back to the first and is the tale of the obscure German novelist the scholars were tracking. The hardest part for me to read was the fourth book, The Part About The Crimes. Each murder is written about like a crime register and it’s 200+ pages of this. I had to take at least a twenty-four hour break. The coolest part about 2666 is the sly coincidences that pop up regardless of which novel you are in. He leaves clues. It’s like you are lost in a corn maze with a crazy Chilean Hemingway. For example, a character in the first novel feels strange in a hotel room because of the position of the mirrors. 600 or so pages later, an unrelated character has the same experience in the same hotel room under completely different circumstances. This is one of the most obvious coincidences, but it made me feel like a book detective. I am sure these coincidences go deeper and that a literature major somewhere will write a huge thesis about the hidden center of the book and the meaning of Santa Teresa as the beginning, middle, and ending place of this huge text, not to mention the meaning of the numeric title. That will not be me however, because reading this book has been work enough.